This article is about the official title "Emperor/Empress of India". For the list of Indian emperors, see list of Indian monarchs. For the British battleship, see HMS Emperor of India. For the British medal, see Kaisar-i-Hind Medal. "Empress of India" redirects here. For other uses, see Empress of India (disambiguation). The title Emperor/Empress of India was used by the British monarchs during the British Raj in the Indian Subcontinent from 1876 (see Royal Titles Act 1876) until 1948, after India had attained independence from the United Kingdom, when for a transitional period the British monarch was also king of the independent dominions of India and Pakistan. The term "Emperor of India" is also used to refer to pre-British Indian emperors (see List of Indian monarchs). 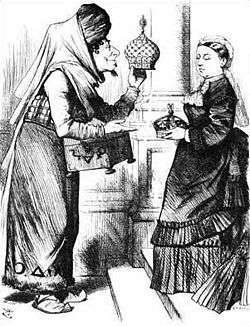 New Crowns for Old depicts Prime Minister Disraeli offering Queen Victoria an imperial crown in exchange for an earl's coronet. She made him Earl of Beaconsfield at this time. After the British East India Company (EIC) deposed the Mughal Emperor, and after the British government dissolved the EIC in 1874, Queen Victoria was given the title "Empress of India" (or Kaisar-i-Hind, a form coined by the orientalist G.W. Leitner in a deliberate attempt to dissociate British imperial rule from that of preceding dynasties) by the Royal Titles Act 1876, from 1 May 1876. The new title was proclaimed at the Delhi Durbar of 1877. The title came into use nineteen years after British India and the British protected states ('princely states') on the Indian Subcontinent came under the control of the British Crown, following the dissolution of the British East India Company. The title had been eagerly assumed by Victoria in 1876, after she had been pressuring Prime Minister Benjamin Disraeli to agree to her assuming the title for some years. The idea of having Victoria proclaimed empress of India was not new as Lord Ellenborough had already suggested it in 1843 on becoming governor-general of India. By 1874, Henry Ponsonby , the Queen's Private Secretary, had investigations well in hand and English charters had been scrutinized for imperial titles, with Edgar and Stephen mentioned as sound precedents. The Queen, possibly irritated by the sallies of the republicans, the tendency to democracy, and the realization that her influence was manifestly on the decline, was urging the move. By January 1876, the Queen's insistence was such that the Prime Minister felt he could procrastinate no more. Initially, Victoria had actually considered the style "Empress of Great Britain, Ireland and India" but the cautious Disraeli, in his desire to avoid controversy, persuaded the Queen to limit the title to India. 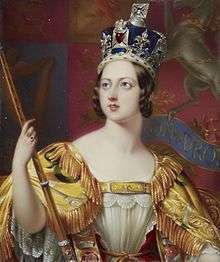 However, many in Britain regarded the assumption of the title as a fairly obvious development from the 1858 Government of India Act when the Crown replaced the East India Company, as the title 'Queen' was no longer considered adequate for the head of what had become known as the Indian Empire. The new styling would underline the fact that the native states were no longer a mere agglomeration but a collective entity. 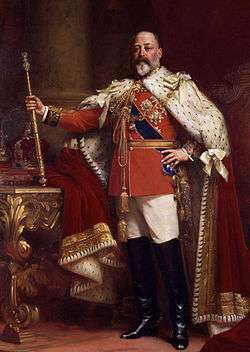 When Victoria's successor Edward VII ascended the throne in 1901, he continued to use the title "Emperor of India", as did subsequent British monarchs. The title continued after India became independent on 15 August 1947 until it was formally abandoned on 22 June 1948 during the reign of King George VI. 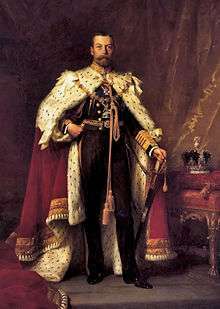 When signing off Indian business, the reigning British king-emperors or queen-empress used the initials R I (Rex/Regina Imperator/Imperatrix) or the abbreviation Ind. Imp. (Indiae Imperator/Imperatrix) after their name (while the one reigning queen-empress, Victoria, used the initials R I, the three consorts of the married king-emperors simply used R). When a male monarch held the title his wife, the queen consort, used the style queen-empress, though she was not herself a reigning monarch. British coins and those of the Empire and Commonwealth routinely included the abbreviated title Ind. Imp., although in India itself the coins said "Empress", and later "King Emperor". When in 1947 India became independent all coining dies had to be changed, which took up to a year and created some problems. Canadian coins, for example, were minted well into 1948 stamped "1947", the new year's issue indicated by a small maple leaf in one corner. In Great Britain itself the title appeared on coinage through 1948. ↑ British rule in India ended on 15 August 1947, but George VI retained the title of King-Emperor until 22 June 1948, and thereafter remained monarch of India until India became a Republic on 26 January 1950. He continued as King of Pakistan until his death. ↑ The London Gazette: no. 38330. p. 3647. 22 June 1948. Retrieved 25 August 2014. Royal Proclamation of 22 June 1948, made in accordance with the Indian Independence Act 1947, 10 & 11 GEO. 6. CH. 30. ('Section 7: ...(2)The assent of the Parliament of the United Kingdom is hereby given to the omission from the Royal Style and Titles of the words " Indiae Imperator " and the words " Emperor of India " and to the issue by His Majesty for that purpose of His Royal Proclamation under the Great Seal of the Realm.'). According to this Royal Proclamation, the King retained the Style and Titles 'George VI by the Grace of God, of Great Britain, Ireland and the British Dominions beyond the Seas King, Defender of the Faith', and he thus remained King of the various Dominions, including India and Pakistan, though these two (and others) eventually chose to abandon their monarchies and became republics. ↑ Harold E. Raugh (2004). The Victorians at War, 1815-1914: An Encyclopedia of British Military History. ABC-CLIO. p. 122. ISBN 9781576079256. ↑ B.S. Cohn, "Representing Authority in Victorian India", in E. Hobsbawm and T. Ranger (eds. ), The Invention of Tradition (1983), 165-209, esp. 201-2. ↑ L. A. Knight, "The Royal Titles Act and India", The Historical Journal, Cambridge University Press, Vol. 11, No. 3 (1968), pp. 488-489. ↑ L. A. Knight, p. 489. ↑ L. K. Knight, p. 489. ↑ L. A. Knight, p. 488.